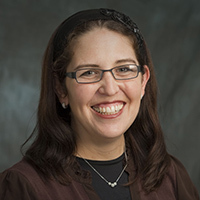 Professor Shoshana Schechter is the Director of the Mechina Pathways Basic Jewish Studies Program and a Bible Professor at Stern College for Women. A Stern and Revel alumna, Professor Schechter originally planned to go to Columbia University but decided to attend Stern College after learning in Michlala. She was involved in many leadership opportunities on campus, including organizing Operation Torah Shield during the Gulf War, and going to rallies in Washington for Soviet Jewry. Professor Schechter’s empowerment did not end there; after participating in many kiruv programs off campus, she realized she did not have to look much harder than the floor above her in her dorm to find women with little to no Jewish background. Rabbi Kanarfogel recruited Professor Schechter to come teach at Stern in 1998 and she soon after began the Mechina Program for Stern students. My students. Teaching is not just about giving over information and material but learning the text in a way that’s meaningful and applicable to life. The students I teach have a real thirst for learning and many of these women have their pick of secular colleges but they come for the high level dual curriculum, Torah classes and shiurim, strong Jewish communal involvement and community networks. The level of learning is very high intellectually and spiritually. We have a relationship beyond the classroom. Anything but teaching. Seriously. When I was thinking about careers, I considered many options, including medicine and law. My father is an orthopedic surgeon and I thought I might follow in his footsteps, and I even worked in a lab one summer. In college, I planned on becoming a journalist. I didn’t want to be a teacher because I felt that anyone could be a teacher. But now I see how wrong that actually is. Growing up, I was exposed to many different types of Jews from a variety of backgrounds because my parents always hosted all types of guests at our house for Shabbat. In college, I ran many informal kiruv programs, including Counterpoint, NCSY and YUSSR. At the time, I didn’t feel the need to teach formally because I felt very fulfilled by my kiruv work. I went to Revel primarily to learn and not to become a Professor. What are the goals of the Mechina program? Our program is geared towards students with little to no formal Jewish education or background. Every class has approximately 20-30 students and they come from all over the world, including Tahiti, South Africa, Ukraine, South America, Morocco, Europe and Australia. Our goal is to create a community of learners who are at a similar stage in their life. We create a vibrant community with stimulating classes, connecting young Jewish women to Am Yisrael, Torah Israel and Eretz Yisroel. We ultimately want to give the students the confidence to integrate into the larger Stern student body. The students continue coming to me for Shabbat and become members of my family. I help guide them through life after Stern including career and even dating guidance. I’ve been to many weddings of my students and often host them even after they get married with their husbands! I was editor of the Observer and received a masters from Columbia in Journalism. I originally wanted to be a journalist but after briefly working as a substitute teacher, I realized I truly wasn’t passionate about journalism the way I was about teaching. I was also a jock – I was Captain of the basketball team and co-captain of the Tennis team.